Kritsada Kongsrichai made sure Jeremy Miado would not defeat another Thai fighter. Kongsrichai exacted revenge for his fellow Thai Dejdamrong Sor Amnuaysirichoke after beating Miado at the One: Spirit of a Warrior at the Thuwunna Indoor Stadium in Yangon, Myanmar on Friday night. 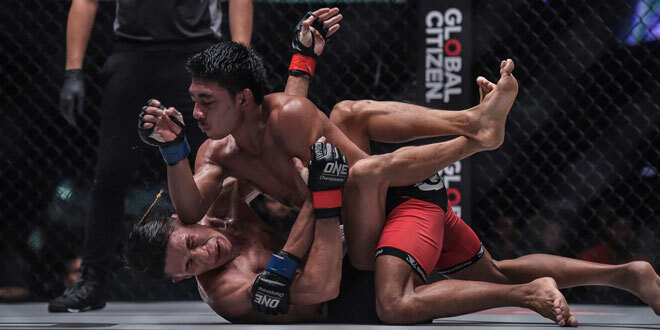 Kongsrichai showed why he was a former national champ in wrestling, quickly bringing the fight to the ground – denying Miado a chance to get his patented striking game – and won via unanimous decision. In the main event that spilled to early Saturday, Aung La N Sang knocked out Ken Hasegawa with less than two minutes left in their epic showdown for the One middleweight title. In a pulsating stand-up battle between two well-known grapplers that went down the wire, N Sang sneaked in a huge uppercut over Hasegawa that put the latter down to the canvas for good at the 3:13 mark — or 1:47 left — in the fifth round.